In terms of Tesla’s survival, this poses a problem. Tesla shares fell 2.8% to $280.74 on Wednesday. They’re now down about $100 from the closing price of August 7 ($379.57) and down $107 from the high that day ($387.46). This was the moment when CEO Elon Musk had pulled another rabbit out of the hat during trading hours in order to brazenly manipulate up the share price by announcing a blatant lie – that he’d take the company private at $420 a share, “funding secured.” Today, shares closed $140 below the buyout-lie number. The ludicrousness of his lie that had instantly spread all over the world had an unintended consequence for eons to come: The term “funding secured” can never again be pronounced with a straight face. As a consequence, Tesla is now steeped in legal issues. It’s not like it doesn’t have enough issues already, with its “manufacturing hell,” as Musk himself called it, that refuses to abate. Jeff Gundlach (we are some of his biggest fans) is a trader at heart, as are we, and is very cognizant of short-term market technicals. 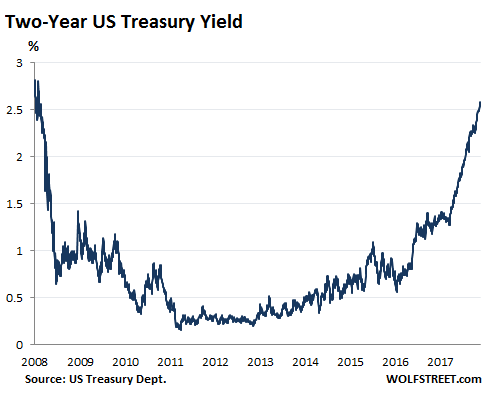 So it’s eye-catching, then, that Gundlach reiterated in a webcast on Tuesday his call that the 10-year Treasury yield would rise to 6 percent by 2020 or 2021. “We’re right on track” for that, he said. As a reminder, that would be the highest yield since 2000. In the near term, the bond shorts may be scorched (or may not) with their record off-side position but given time long-term interest rates are going much higher than the markets believe. Deteriorating flow technicals will bring term premia back with a vengeance. The trigger will most likely be the bursting of the European bond bubble. The Portuguese 10-year trading at half the yield of the 10-year U.S. Treasury? Come on, man, Are you serious? When Super Mario takes his foot off the pedal, turn out the lights on those holding the Spanish 2-year at -0.327 percent, or the 10-year bund at 0.34 percent. To continue reading: Will The Real Bond King Stand Up? 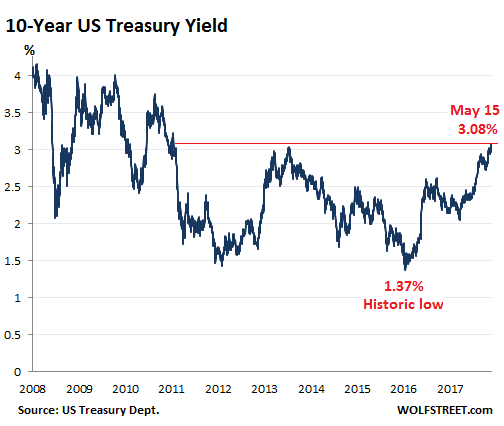 Today the US Treasury 10-year yield broke out of its recent range and surged 8 basis points to 3.08% at the close, the highest since July 2011. The price of a bond falls when its yield rises. The odds have been stacked against the bond market for a while: the Fed’s rate-hike cycle, the Fed’s QE Unwind, a surge in government spending, the tax cuts, and the ensuing onslaught of debt issuance that is looking for buyers. 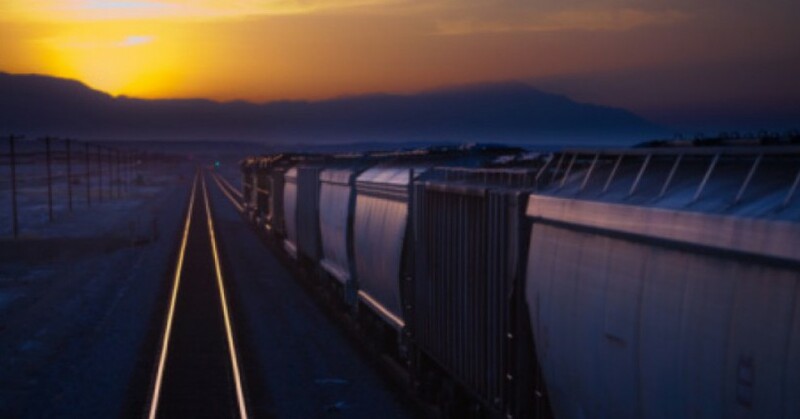 In addition, and with impeccable timing, the biggest US corporations with the most “cash” parked “overseas” are now “repatriating” this “cash” and are using it to buy back their own shares. 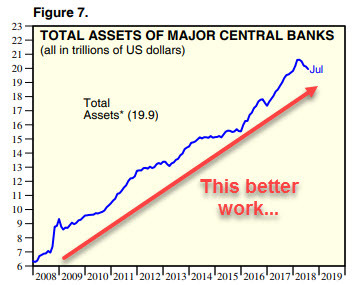 What this really means for the bond market is this: This “cash” isn’t cash but is invested in securities, mostly US Treasury securities, corporate bonds, and the like. Companies are now selling those securities in order to use the proceeds to buy back their own shares at a record pace. So these huge bond buyers have turned into net sellers. In other words, to entice enough new investors into the market, yields have to rise to make those bonds more attractive. The difference (spread) between the two-year yield and the 10-year yield widened from 45 basis point to 50 basis points (0.5 percentage points), as the 10-year yield rose faster today (by 8 basis points) than the two-year yield (3 basis points). llinois’ brutal political campaigns may have distracted attention from the reality of the state’s crumbling finances, but an upcoming $500 million bond borrowing by the state will remind investors and Illinoisans alike how little has improved. Both Moody’s and S&P recently affirmed Illinois’ one-notch-above-junk rating in preparation for the state’s upcoming bond. And Moody’s continues to maintain a negative outlook on Illinois’ rating. That means a downgrade by the agency is more likely than an upgrade in the next year. The reasons for the rating agencies’ pessimism are obvious. It’s not just what lawmakers have failed to do, it’s what lawmakers continue to do that’s dragging the state down. The state continues to operate at a deficit despite nearly $5 billion in new taxes in 2018. And the shortfalls aren’t being compensated with spending reforms. Instead, the state continues to primarily use interfund sweeps to make the general budget balance. And the agencies don’t expect any big reforms this year – not with a stalemate that might ensue during this campaign season. Bond investors are demanding a heavy price from Illinois for the increased risk they are being asked to take. According to Municipal Market Data, Illinois will pay yearly interest rates that are 2.1 percentage points higher than the states with the best credit ratings – states that include Indiana, Iowa and Missouri. By comparison, states like Connecticut and New Jersey, states with severe pension crises, only pay about 0.85 percentage points more than the best-rated states. Illinois and its taxpayers are being heavily penalized for the state’s fiscal and governance mess.